Tips for Great Beach Photos: What to Wear! You’ve carefully planned your Crystal Coast vacation. You’ve made difficult choices like whether to stay near Atlantic Beach, Salter Path or Emerald Isle. You carefully picked a date to have portraits made at the beach and hired a great photographer (hopefully me!) to do the shoot. But what about clothing for your photos? Here’s a few tips on what to wear to make the images from your beach photo session the best the can be. With the beauty of our North Carolina beaches in mind, a laid-back casual look is probably the best way to go. Many families choose to coordinate their clothing choices for their location portraits. You may want everyone to dress in identical colors, or simply color coordinate the group. Popular color choices include either white or pastel tops with khaki or denim slacks, pants or capri’s. As a general rule it’s best to avoid patterns and bright colors. After all, you want the attention to be on the people in the photos, not their clothing. A great variation of the classic khaki/white or denim/white beach color scheme might be for the women and girls to wear long, flowing white dresses instead of slacks or capris. A beachy straw hat can be a nice touch for the girls as well. Another option might be for the guys to wear darker tops, like denim shirts or dark polos. Another way to mix things up is if everyone matches colors but with a mix of styles. One guy might wear a light blue polo, another an oxford. This allows everyone to express them self with their own style. Sleeveless shirts and blouses are usually not the best choice. Wearing either long or short sleeves tends to make more pleasing pictures. While this is especially true for the ladies, it applies to men as well. Generally people don’t like how they look in photographs when wearing shorts or short skirts. You’ll probably be happier with your portraits if you stick to long pants or capri’s. For summer portraits, many families choose for everyone to be barefoot. Of course sandals or flip-flops can be great too, we are at the beach after all! Makeup should be kept as natural as possible. It is fine to place some emphasis on your eyes and lips. Be careful to not to get too sunburned, it’s not the greatest look for a portrait. A great tan will photograph very warm, but don’t over do that either. While make-up isn’t recommended for men, an evening portrait on one of the Crystal Coast beaches will greatly benefit from a fresh shave! Even with modern image enhancement techniques, removing a five o’clock shadow is almost impossible. Though you may not normally use hair spray or other products to hold your hair in place, it is a good idea to use something before coming to the beach for your portrait. An afternoon or evening sea breeze is quite normal along North Carolina beaches. Even a slight wind can blow hair in front of eyes and cause people to keep moving their arms and hands to remove it. The best advice is to use some hair product before you arrive or bring it along in case you need it. Hair bands and ponytails are another good alternative. Young children may have a favorite beach toy that they like. It might make a great shot if they are allowed to hold it. Depending upon the child, it may be the only way to get them to sit still for a shot. Older children may want to bring a surfboard or skim board, or some other favorite beach toy. It all adds to the personality of the shot. It’s always helpful if youngsters are well rested and fed before they arrive for the photo shoot. 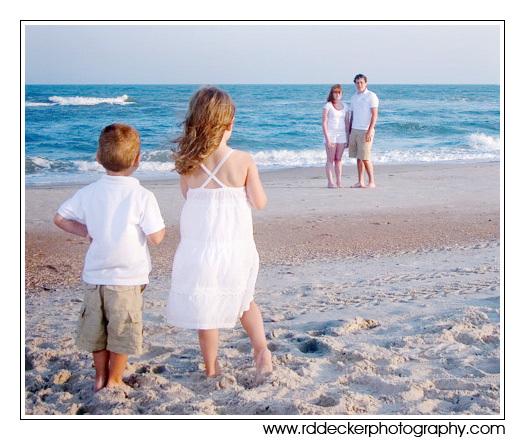 So there you go, a few simple suggestions for making your family beach photos look great. Remember, keep it simple and casual… fun and relaxed. You’re on vacation. Have fun! What to wear tips are always great for on-location photos. This is a good list for anyone seeking to have a successful on-location photo shoot. Keep up the good work! What a smart idea! It is so important for clients to know what to wear so their images ROCK! These are great tips! Even though there aren’t any beaches in Colorado, many of these tips do apply anywhere. And I have done a couple destination weddings at the beach and I’m hoping to do some more! Great tips for portrait clients. I like the photo that goes with this post — the kids with their parents in the distance. A lovely photo they’ll treasure for many years to come. Very useful tips! Thanks for sharing! I did not know photo shoots by the beach need to be well planned as well. This is an excellent post. I think it is great to educate and guide prospective clients. Plus having a sample image to demonstrate is a great idea. Great info here, thanks so much for posting. I’ve never shot on a beach but sure would like the opportunity. Great tips. Very handy for clients. I was just researching why everyone weras white shirts in beach pictures. We have plenty of them. I like the suggestion of having the guys wear a different color. Anyway, great tips. Thanks. Thank you for the tips. I am a beginner photographer and i would like to photograph on a beach. i did it but it didn’t look very nice but with these tips i’ll be a lot better! Great tips! Looks like a wonderful place to shoot! Sound advice about making faces,etc. stand out from the picture. It’s all about deciding what you want to stand out from the other elements to create contrast. Tips were useful for me as I am about to visit Konkan (Maharashtra). It is famous for beaches. 🙂 Thanx a lott… This was tooo useful. free patform like WordPress or go for a paid option? Thre aare so many choices oout there that I’m completely confused ..